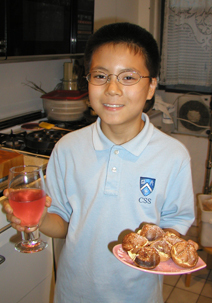 Saw the Danish Ebelskiver Iron on Williams-Sonomaâ€™s catalogue, thought of the red (Adzuki) bean paste stuffed pancake I was so fond of as a child, I knew I had to have it. The Danish calls it â€œebelskiverâ€, we Taiwanese makes it in the shape of car wheel and simply calls it car wheel â€œtcha luanâ€, and the Japanese makes it in the shape of fish called â€œtaiyakiâ€ (red snaper bake) or in round shape called â€œdorayakiâ€ which is Doraiemonâ€™s favorite food I guess there is a version of it in every culture… whatever sweet treat it is stuffed with, it is delicious! 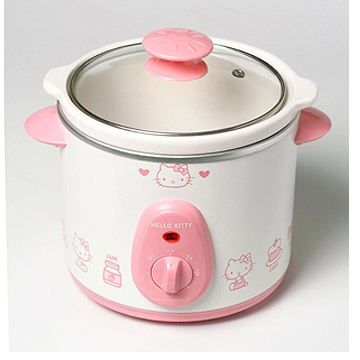 Hello Kitty slow cooker to cook the red bean to perfection (then chilled and sweetened with Organic Raw Agave Nectar , which does not effect the blood sugar), grain mill to ground fresh organic whole soft wheat for flour, and Ebelskiver Iron.